I was born in the middle of the Second World War (chronologically speaking, I don’t mean I was born on a battlefield). I was educated at Bryanston School, where I developed a love of the arts and an affection for the county of Dorset. I wanted to become a medical missionary, so I took sciences at A level prior to studying medicine. I found later that the sciences were useful for a writer because these subjects taught me to be objective and precise, while the mathematics they required taught me to be logical. I gave up my faith but pressed on to University College Hospital, London, where I appeared three times in the ‘Fallopians’ Revue and helped to start a drama group. I got as far as delivering babies and failing Pharmacology. I had a sophisticated bedside manner, but was hopeless at diagnosing what was wrong with the patients. While the other students palpated the lump in the abdomen, heard the heart murmur or studied the lesion on the retina, I thought the patient’s belly, chest or eye were more or less normal. When I decided to withdraw from the course, the vice-dean apologised for taking me on in the first place and wasting so much of my time! With a view to going to drama school, I took private acting lessons in the evening while by day I worked for spells as a sales assistant in a bookshop, as a slicing machine operative’s assistant in a bakery and as a bath attendant at a swimming pool. I got a place at the Webber Douglas Academy of Dramatic Art but by then I had become engaged to be married so I felt the need for a secure career and gave up my dreams of the stage to join Marks & Spencer as a management trainee. After two years in stores I transferred to the head office in London, where I progressed from clerical assistant, through lingerie merchandising and the Business Information Department, to become the Company’s only-ever full-time Speechwriter, a post I held for 15 years. In my spare time I wrote and sold comedy material and appeared in a number of plays. As a speechwriter I put words into the mouths of three Marks & Spencer chairmen and a number of directors, as well as preparing items for publication such as the Chairman’s Statement in the Report and Accounts. I learned on the job, acquiring the disciplines and honing the skills that would stand me in good stead later on. When the Company Archivist, Paul Bookbinder died unexpectedly, I finished the biography of Simon Marks that he had been writing and wrote all the captions for the photographs. 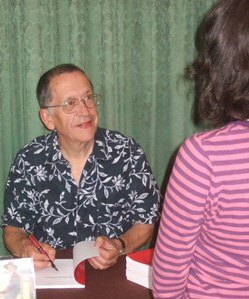 In 1998, after 32 years’ service, I took early retirement to concentrate on creative writing. I returned to Dorset and settled in Wareham. For six years I wrote a light-hearted column for the Frome Valley and Isle of Purbeck Gazette. I re-invented myself as a performance poet, winning the Poole Word & Book Festival’s Poetry Slam in 2003 and becoming its Poet in Residence in 2004. I won the Bournemouth Literary Festival Poetry Slam in 2010. I am an active member of Wareham’s Rex Players, who every year in aid of charity put on a variety show that runs for a week. 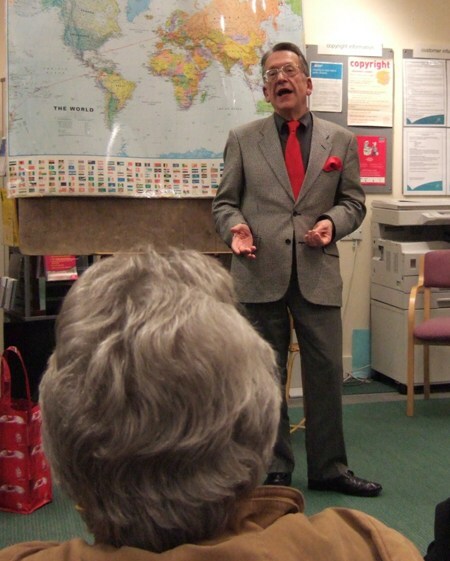 I have done after-dinner and after-lunch speaking, appeared in the Bath Festival Fringe and put on a one-man family show at the Marine Theatre, Weymouth. I have recently developed “Poetry a la Carte”, a new way of presenting my own and other poems, in which members of an audience choose poems (from a menu) for me to perform. In 2007 I set myself the challenge of going round the world without flying and my book ‘SURFACE MALE – Round the World Without Flying’ is hitting the shelves – and knocking them over. (See Round the World) I haven’t flown since. In July 2013, with the help of friends and family, I raised £1,000 for the charity Toybox’s work for street children in Central America, by doing a 28-mile sponsored walk in the Peak District. In 2015, I converted my garden to a temporary open-air theatre, known as GOAT (Grandpa’s Open-Air Theatre) and put on a show with my family, consisting of poetry and the world premiere of my short play “Barnacle’s Books”. In July 2016, I revived the GOAT to put on a benefit concert, featuring mezzo-soprano Grace Lovelass, with a supporting cast and including a new mini comic opera “Carmen and the Car Repair Men” with a libretto by me, to raise money towards the next stage of Grace’s opera training. With a well-established career as a late developer and a mental age of 38, I feel I have nothing to look forward to . . . but a glittering future. I am a widower with two sons, two daughters-in-law and four grand grandchildren. I am a member of Wimborne Speakeasy, the Dorset Humanists and the Movement for the Abolition of War. I like listening to classical music, walking, talking and eating fruit. I am a humanist, a member of the Green Party and a recently converted vegetarian.